Today, trust in both business and government, particularly among the young, is roughly the lowest it has been since the Great Depression. How do the institutions central to the functioning of society and the world economy begin to recoup that lost trust? Oxford academic Karthik Ramanna studies how organizations build trust with stakeholders and the role of innovative businesses in designing sensible and responsible “rules of the game.” A pragmatic advocate of democracy and free enterprise who also recognizes the need for change and adaptation, Ramanna helps both the corporate and public sectors reach out to skeptics and opponents, devise strategies for building confidence and reimagine their place in the great global debate over equity and trust. 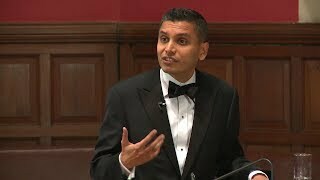 Ramanna, a professor of Business and Public Policy at the University of Oxford, is an expert on business-government relations, sustainable capitalism and corporate reporting. A leading authority on corporate accounting standards and practices, Professor Ramanna unraveled a stark reality in the aftermath of the 2008 financial crisis: in their drive to profitability, companies were shaping the rules of the global economy in ways that subvert capitalism itself. He addressed these issues in his 2016 book, “Political Standards: Corporate Interest, Ideology, and Leadership in the Shaping of Accounting Rules for the Market Economy” (University of Chicago Press), which explored the role of industry experts in setting standards and norms for market behavior. Through his keynotes and advisory services, Ramanna guides companies on steps they can take to enshrine integrity, transparency and accountability within their governance structures. In doing so, firms can not only bolster their own reputations and leverage that to increase profits, but can also help remedy the essential problem of trust that afflicts modern capitalism, which could potentially be its downfall. 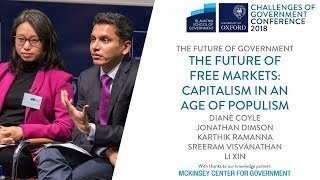 In addition to his work on reforming capitalism and building organizational trust, Ramanna is a leading scholar on how public institutions can sustain a reputation for excellence and serve as magnets for top-tier talent. Ramanna argues that a major contributor to the decline of trust in capitalism is the draining of capacity for action of public sector institutions. Using case studies of organizations that have successfully served as beacons of competence and prestige, Ramanna offers concrete lessons for institutions seeking to attract the best and brightest while doing good. Professor Ramanna, who has authored dozens of research articles and case studies on non-market strategies in Africa, China, the EU, India and the U.S., has consulted with several leading professional service organizations worldwide. His scholarship has won numerous awards, including the Journal of Accounting & Economics Best Paper Prize and the Case Centre’s Outstanding Case-Writer prize, dubbed by the Financial Times as “the business school Oscars.” He is the faculty chair of the Transformational Leadership Fellowship, a bespoke, by-invitation, part-time program for senior corporate executives considering a second career that can bring their strengths to address broader societal challenges. Ramanna is also the inaugural director of Oxford’s Master of Public Policy program, a flagship one-year degree for current and prospective leaders in government. He is currently working on a book project that explores how the institutions of free-market societies must adapt to survive both declining public trust and transformational technologies like artificial intelligence. Prior to his roles at Oxford, Professor Ramanna taught leadership, corporate governance and accounting at the Harvard Business School in both the MBA and senior executive education programs. He is a faculty associate at Harvard’s Weatherhead Center for International Affairs and has a doctorate from MIT’s Sloan School of Management. He has served on the editorial boards of several scientific journals, including as co-editor of the interdisciplinary journal Accounting, Economics and Law. Karthik Ramanna is available for paid speaking engagements, including keynote addresses, speeches, panels, and conference talks, and advisory/consulting services, through the exclusive representation of Stern Speakers, a division of Stern Strategy Group®. 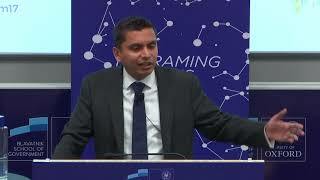 In this presentation, Ramanna can elaborate on powerful analytical tools such as bridging capability asymmetries, managing perception gaps and setting and delivering on legitimate expectations. Why is free-market capitalism – seemingly the winning formula for the success of nations since at least the end of World War II – losing popular support worldwide? America is a case in point. Where once the U.S. was synonymous with free markets, today we see the specters of economic nationalism and even socialism. How did we get here? Wages for jobs in the lower third of population skills have stagnated or declined over nearly forty years. This deterioration is visible in occupations affected by automation and global competition – policies encouraged by market liberalization. Moreover, as America pursued free trade and free markets, it was slow to upskill those most vulnerable to economic change. In the face of further disruption from artificial intelligence and rising authoritarianism, how should multinational businesses respond? As public institutions have failed to act, more is being expected of corporations. But how much of the solution is within the corporate mandate and capabilities? And how can corporations do so without losing focus on profitability, particularly in the face of intense international competition? Professor Ramanna’s presentations equip audiences with a framework for business leaders looking to engage in an increasingly hostile and populist world, where long-held rules for global engagement are coming undone. Listed corporations are locked in a dysfunctional game with Wall Street intermediaries, where hundreds of billions of dollars are lost to financial reporting shenanigans such as meeting artificial earnings-per-share benchmarks. Meanwhile, corporate auditors are criticized for their seeming willingness to accept aggressive accounting practices. Overall, this scenario has helped deplete public faith in capital markets, contributing to the populist backlash on finance. How can boards, senior management and auditors in listed corporations break out of this flawed equilibrium? In this presentation, Professor Ramanna discusses which accounting and non-financial reporting practices mitigate manipulation of capital markets and build trust with investors and other stakeholders. He explores the role of prudent, verifiable and timely reporting principles as bedrocks of modern capitalism, and offers a framework for designing reporting standards that promote transparency and stability in the global financial system.